Fertilizer plants in TX blowing up and destroying half a town. Idiot former Justice of the Peace murdering 3 people over stolen computer monitors. All of these are unfortunate events. Our collective prayers go out to the victims and their families. I shouldn't be but I have been a bit surprised at the differences in levels of coverage and styles of coverage and commentary from the "mainstream" media related to these situations. 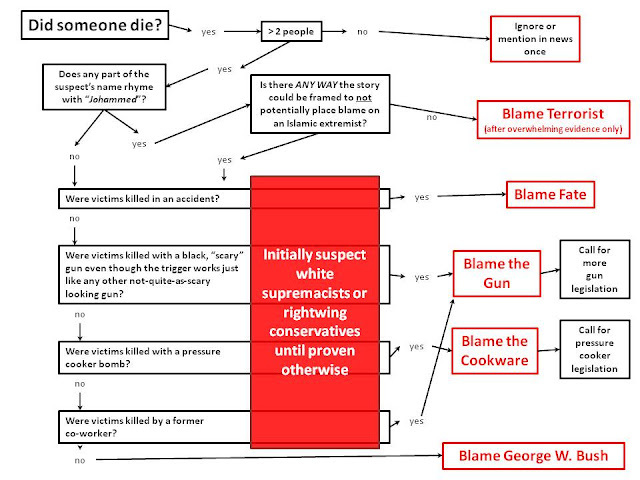 In the continual effort to help, I threw together the following "decision tree" to help assign blame appropriately.